February 2, 2017 by Ken Ward Jr.
Later today, the U.S. Senate will almost certainly vote to approve a resolution to block a last-minute Obama administration rule aimed at replacing the long-controversial stream “buffer zone” rule. The House passed the resolution yesterday afternoon. Once that resolution makes its way to the White House, President Trump will sign it. Presumably, it won’t take long after that before all of the coal miners in West Virginia who have lost their jobs over the last few years will get called back to work. Well, at least that is what coalfield political leaders, industry officials — and now the most powerful man on the planet — would have residents of places like Boone and Logan counties in West Virginia believe. It is time to give the families of the coalfields all across America a chance to get relief from the unelected bureaucrats in Washington. Stopping this rule matters to West Virginians, to our miners, to our families, to our consumers. We produce 95 percent of our electricity from coal. It is reliable and it is affordable … My State can’t afford to lose any more jobs, and I know that goes for other coal States. … If there is a war on coal, it is being led by the natural gas industry who produces a cheaper product at a lower cost. And if there is any trouble that coal is in, it is directly attributed to the free market and that competition. A Democrat from Kentucky, Rep. John Yarmuth, reminded House members that mountaintop removal has real consequences. None of the Republicans wanted to take him up on his challenge that they drink some water from a well that was contaminated by a Pike County mining operation (see video above). 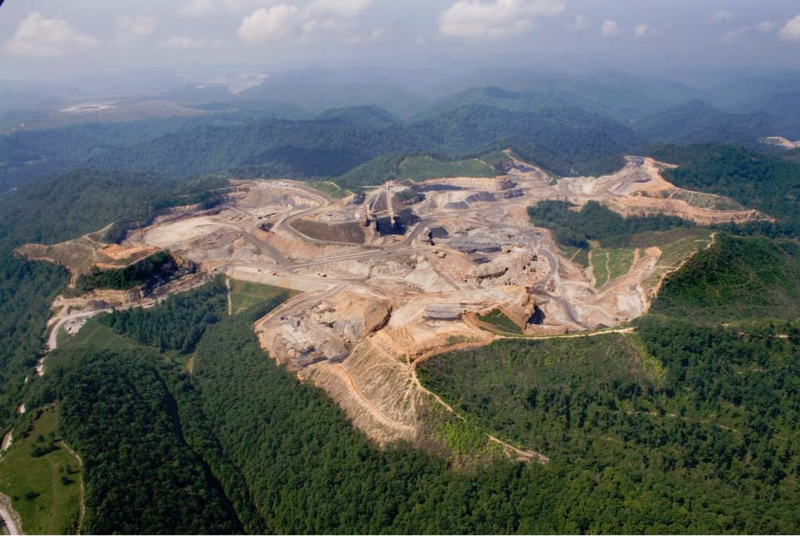 Earlier in the day, Yarmuth had reintroduced his Appalachian Community Health Emergency Act, legislation that would place a moratorium on all new mountaintop coal removal mining permits while federal officials examine health consequences to surrounding communities. I have been committed to pursuing any legislation to … protect our coal mining communities and economies and that is why I am glad to introduce this resolution of disapproval to undo this harmful, overreaching regulation. I remain unconvinced that this jobs-killing regulation is necessary or substantiated, particularly when you consider state and federal regulations already in place. The consequences of this regulation will have far-reaching impacts on the future of coal mining and, therefore, will only serve to hinder development of affordable reliable energy. And West Virginia Gov. Jim Justice, who ran as a Democrat, issued his own press release to make sure everyone knew he was on board with what Congress was doing. This rule would further cripple coal mining in West Virginia and in other states across the country and is a drastic overreach by this regulatory agency. West Virginia has been harmed significantly in recent years due to burdensome rules and regulations imposed on the mining industry at the federal level and I ask you today to help us begin the process of healing our economy and putting our miners back to work by rejecting this rule. What’s ironic here is that when Congress and President Trump get done, the rule that will be in place is actually — if enforced — far more stringent than either the Obama administration’s “stream protection rule” or an earlier rewrite attempted by the Bush administration. And under the tactic used by Republicans in this instance, OSMRE’s hands are tied as far as trying to come up with some other version of the rule. When valley fills are permitted in intermittent and perennial streams, they destroy those stream segments. The normal flow and gradient of the stream is now buried under millions of cubic yards of excess spoil waste material, an extremely adverse effect. If there are fish, they cannot migrate. If there is any life form that cannot acclimate to life deep in a rubble pile, it is eliminated. No effect on related environmental values is more adverse than obliteration. Under a valley fill, the water quantity of the stream becomes zero. Because there is no stream, there is no water quality. Question (and I admit I haven’t read the rule): Would this do away with the variance that is almost always granted by WVDEP for mine permits that allow for disturbance with 50 feet of a intermittent and/or perennial stream? It simply does away with the Federal Government over-regulating the coal companies that create the very needed jobs in the state. Its about time someone stood up to stop the “War On Coal”…. It certainly would be beneficial to fully explain and show what a “stream” really is relative to government regulations as I guess it is vastly different than what most may believe. Government balance this issue especially the jobs, business and environment. If there is business and jobs, it should not compromise the environment.